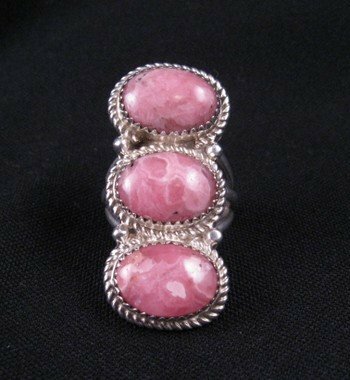 Long Native American handmade sterling silver ring with three oval pink Rhodochrosite stones, made by Gene & Martha Jackson. Rhodochrosite (whose name means rose-colored) is a very attractive mineral with a vivid pink-rose color that seems to be transmitted out of the crystal as if lit from within. 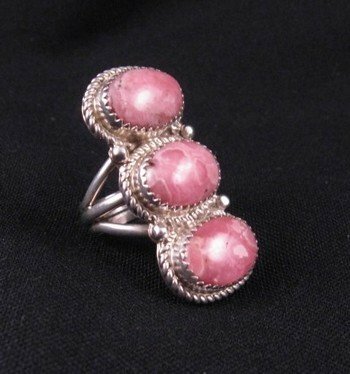 Its pink and white bands are extremely attractive and are often used in semi-precious jewelry. The face of the ring measures a bit over 1-1/2 long. Three wire band ring. Brand new and in perfect condition. Gift Box and Certificate of Authenticity included. Hallmarked by the artists. Size 8. 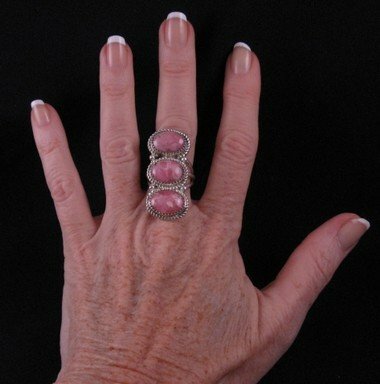 The workmanship is impeccable - you can always depend upon quality when you purchase a piece of Gene & Martha Jackson jewelry. 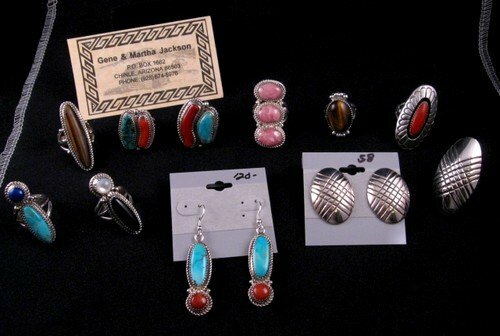 Martha and Gene Jackson are Navajo silversmiths from Arizona. They have been making beautiful handcrafted sterling silver jewelry since the 1980s. They are featured in many Native American jewelry books and have won many awards. Gene can trace jewelry making back at least one generation, and forward two more, as he learned from his father and has passed it on to his sons, who have also taught their children. Martha just recently passed away in January 2019.